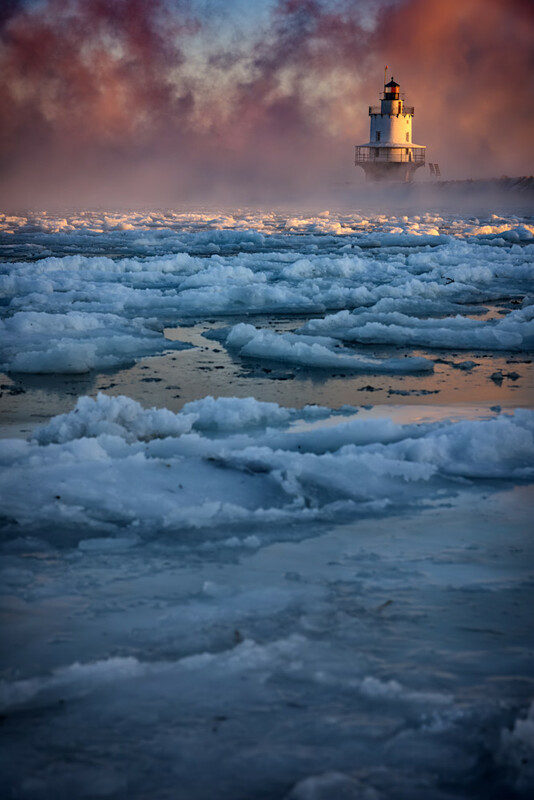 Sea smoke, caused by frigid air moving over warmer water, engulfs Spring Point Ledge Lighthouse at the entrance to Portland Harbor in Portland, Maine. The early morning sun turned the sea smoke a deep reddish color on a freezing morning at Spring Point Ledge Lighthouse. Sea smoke is a fog caused by frigid air moving over warmer water. Pancake ice floats on the waters of the harbor. On this particular morning, the temperature was -4°F, causing the sea smoke phenomenon to be especially strong.